During the same walk where we saw tulips near the end of their time in the Brookside Gardens, We noticed a lot of other spring finery along the pathways. I always look at the ginkgo tree near the conservatory; the leaves are unfurling, and the mail flowers are abundant. Multiple leaves come out from a single bud, so they look like clumps early in the season. As the leaves get larger the clumps overlap and are not as obvious. The azaleas are beginning to bloom. Bushes peak at different times. Some were still just buds last week. The flowers that are a mix of white and deep pink are probably my favorites. There was a peony near the path…. lovely from every angle. Dogwoods are blooming too. The tree is one of my favorites. 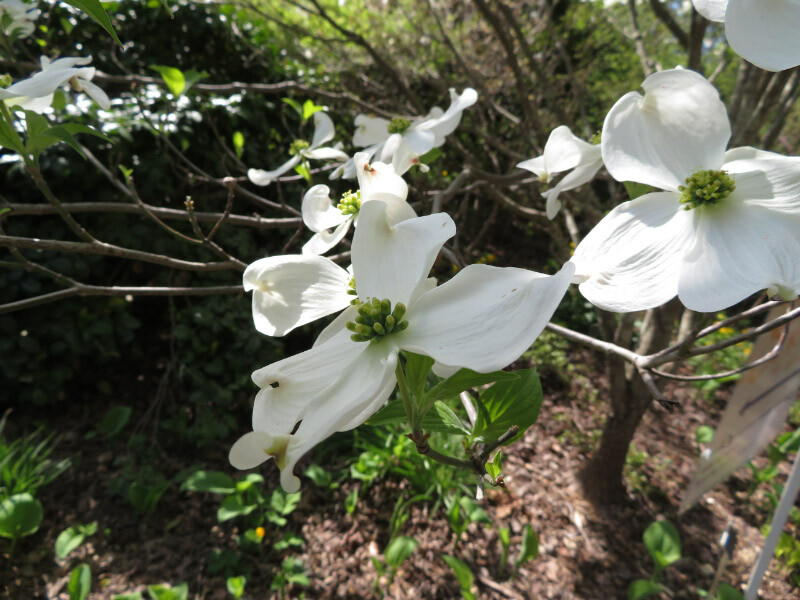 We had a dogwood in our yard when we first moved to the east coast 35 years ago; that’s when I really learned about the tree…observing it throughout the year. The trees in our area now survived the disease that wiped out many of the trees about 10 years ago….and they are blooming robustly this year. So - the blooms will fade, and their will be even more abundant greens – all shades…deepening into the richness of summer.